Blind activist and lawyer Chen Guangcheng emerged Wednesday from six days holed up inside the US embassy in Beijing after a dramatic escape from his home village in Shandong province, where he was being held under house arrest. He had left the embassy after a deal had apparently been made which gave "clear assurances" that both he and his family would be safe to stay in China unmolested. But soon after his arrival at Chaoyang hospital a different story has emerged. Speaking to a number of different news organisations he said he had left the sanctuary of the US Embassy because of threats to his family. "The Chinese side has guaranteed my freedom and my legal rights," he told the Daily Telegraph. "However, yesterday evening I saw that my phone was being controlled and I heard what had happened to my family and I now feel unsafe. I want to leave China, which is also what the White House had originally advised me to do." He said his home had been turned into a "prison" and asked for help to leave the country "safely". But having left the safety of the US Embassy, Chen now faces an uncertain future. Speaking to Sky News correspondent Holly Williams the blind activist said that his wife and two children were with him but his mother was still at home and he did not know her situation. Speaking about the feelings of insecurity he said he couldn't reach any family members by phone and his mobile had been tampered with. "On my mobile phone last night, I couldn't dial out or receive calls. This morning, I can answer calls but can't dial out." He said that Shandong officials had made terrible threats, threatened his family with sticks, and threatened to beat them to death. "They [the local officials] broke into my home armed with sticks and wanted to beat my family to death. They've installed seven video surveillance cameras in our garden, on the roof, and inside our house. And they're going to install an electric fence around my house," Chen said. Asked why he had not previously expressed the desire to leave China, he said he had not been able to obtain all the facts. "At that time, I didn't have all the information. I couldn't get information. Now I have it, and I sense certain things, so I've changed my mind." Chen now says he wants to leave China and seek asylum in the US. "I hope they will help me to leave," Chen told Sky News. But it may be too late for the activist, and little the US can do for the activist who faces an uncertain future. US ambassador Gary Locke said Chen was "never pressured" to leave, though Chen claims he was let down by the US for not giving him the full picture. He told CNN that he only found out that his wife and family had been threatened and beaten after he left the US Embassy. He also found that many of his supporters including He Peirong, the young female activist who had helped in his escape, had been rounded up and arrested [D Mail]. For a man held in captivity for years and beaten, claiming he had not been given the full picture seems a weak argument for having made a bad decision. It should have been clear that the authorities would have sought retribution after his escape. If he had agreed to any 'assurances' offered by China this might be seen as somewhat naive, as would any belief that he could now change his mind and return to the US with his family. It seems likely that Chen and his family will quietly be 'disappeared' once the media storm around him has calmed. The blind dissident may not be the only victim. His situation raises wider questions about Sino-US relations which could prove costly for Barack Obama, who has already been accused of being too soft on China by Republican presidential candidate Mitt Romney. The situation has already overshadowed talks between China and the US. Foreign policy, economic issues and climate change are amongst the topics of discussion. US Secretary of State Hillary Clinton did not address Chen's plight directly but stressed that China has to respect human rights. "We believe all governments have to answer our citizens' aspirations for dignity and the rule of law and that no nation can or should deny those rights," she said. But it seems China will not be bullied. Speaking on Thursday Chinese president Hu Jintao said, "Given our different national conditions, it is impossible for both China and the United States to see eye to eye on every issue." China has already expressed its anger over the incident, but there is anger too coming from Chen's supporters and human rights' activists who say the US has not done enough to ensure the safety of the dissident. For its part China has called on the US to stop misleading the public on the whole affair. In a short post published by the state news agency Xinhua it said Clinton's statement was an attempt to mislead the public and said that Chen had left the embassy "of his own volition". Meanwhile any discussion on the matter was being heavily censored yesterday. 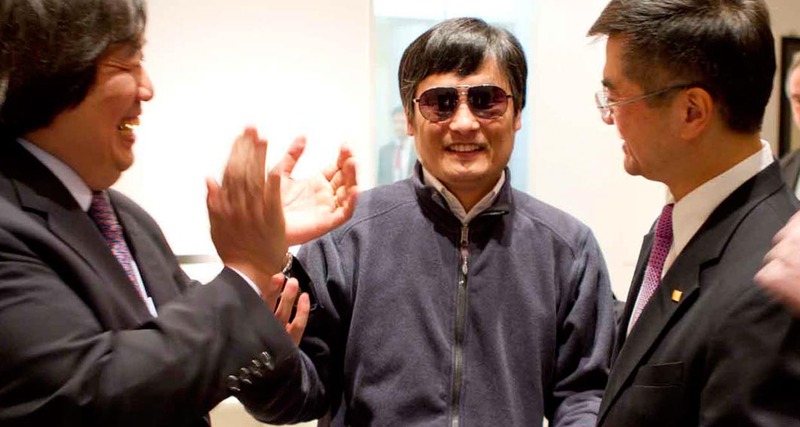 Blogs and microblogs in China have been screened for any mention of the Chinese dissident. As well as bans on the lawyer's name and even initials, words such as 'blind' or 'blind man' have been blocked. The phrase "on my own volition" has also been banned after microbloggers began to post messages say they had left their job or other activities by their own volition. News reports in Chinese were also heavily censored with some items deleted from the web.